Madrid skipper Sergio Ramos was shown a late red card. REAL MADRID THREW away their lead and perhaps their hopes of catching Barcelona as Girona came from behind to pull off a shock 2-1 victory at the Santiago Bernabéu on Sunday. Their first league victory since November pushes them four points clear of the bottom three. Solari will take some of the blame after he fielded a rotated line-up following the Champions League win over Ajax in midweek, their seventh win in eight games. Girona threatened in flashes. Stuani drew a decent stop from Thibaut Courtois and Alex Granell’s drive whistled past the post. But Madrid never looked troubled and it was no surprise when Casemiro nodded in Kroos’ cross after Bono elected to punch rather than catch the initial ball in. 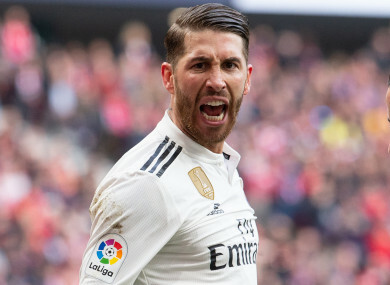 Email “Sergio Ramos sent off as Real Madrid horror-show rocks title hopes with shock Girona defeat”. Feedback on “Sergio Ramos sent off as Real Madrid horror-show rocks title hopes with shock Girona defeat”.